New Year’s Eve is a night where friends and family get together and celebrate the success of the year that has just passed by, as well as the excitement of the year to come. One of the best places to be over New Year’s Eve is Dubai in the UAE. This is because there are a vast array of parties, dinners and fabulous events that are hosted in this bustling city – the perfect place to see the New Year in with elegant style and the utmost celebration! If you are looking for a sophisticated dining experience, you will definitely be spoilt for choice. Most of the top Dubai restaurants situated in hotels and beach resorts hold special New Year’s Eve dinners that provide the public with an extremely epical set menu, live entertainment and special deals. Atlantis, The Palm is hosting three different dinner packages, depending on the type of cuisine you are after. They are also hosting a Royal Gala, complete with a band and buffet dinner. 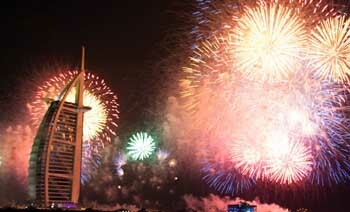 Other special New Year’s Eve dinners include various offers at the Jumeriah Beach Hotel and the Burj Al Arab Jumeriah. If you are not feeling up to a sit-down dinner, then why don’t you head to Downtown Dubai for one of their famous New Year’s Eve special events. Attractions include various entertainment like dances and musical performances, as well as watching musician’s serenades you on the steps of the tallest building in the world, the Burj Khalifa. There is also a Gala held on the Burj Lake, if you would like to combine the two. In addition to this, you can watch the water, light and fire show – a sensational way to welcome in 2016! If you’re looking to party the night away, most clubs are hosting events which include famous DJs, endless champagne and various other party specials. Popular choices are the White Masquerade at White Dubai club, the Nasami Beach Party at Atlantis, The Palm and Blue Marlin Ibiza New Year’s Eve Party with Luciano and Davide Squillace, to name a few. No matter where you are, it is imperative that you end off your evening watching the spectacular fireworks display! The best spots to watch from include Downtown Dubai. The Palm, various beaches and rooftop restaurants. According to the website Kayak, Dubai was voted the trendiest New Year’s Eve destination, and it is more than easy to see why! * Book a flight now before prices go up.